Our team are ready to help - please email us at info@lovingtribute.co.uk or call on 01600 775350. What sizes does the stationery come in? What type of digital image can I upload? Please upload your image in a JPEG, jpg, png or gif format not larger than 5MB. Other formats such as PDF will not work. If you are scanning in a photograph you can change the settings on your device so it automatically saves the file in the favoured JPEG format. Our designs allow one photo each to the front and back cover, we also have many beautiful designs that do not require a photograph. If you would like more images included on your order this can be accommodated within our bespoke design service for which there is an additional charge. Please contact one of our team on 01600 775350 or by email info@lovingtribute.co.uk to discuss your requirements. Can I order several items at the same time? Yes, you can order as many items as you wish. If you select to purchase all of our products in one order there is a very generous discount of 20% applied at the checkout stage. Can I create more than one order at the same time? Yes, with our easy stationery creator you can create as many orders as you require, save them, and return to them at a later date. What is the Free Memorial Notice? Our elegant Memorial Notice is the 21st century answer to the newspaper announcement and takes the strain out of notifying the details of your loss and funeral arrangements during this very difficult time. Specially created for the digital world, it includes all the information you would seek to pass on and is created especially for uploading online where smaller image sizes are desirable. It is a web ready image ideal for sharing on social media such as Facebook and Twitter, and for emailing or posting anywhere else you wish online. I haven’t got time to finish my order today, how do I save it? All documents are automatically saved as you create them. You can also use the order progress menu on each page to go back and change details of your order at any stage during the creation process, without losing the information you have already entered. Once you have created your first draft and clicked to download your proofs, an account is automatically opened for you and an email sent to the email address you provided on the “Begin with a few details” page. This email will contain a link to your account where you can set up a password and access your order to continue editing or to complete your purchase at any time (see image below). Can I add or delete pages? The page length is automatically controlled by the amount of content you want in your service up to a total of 8 pages ( Front Cover, Back Cover and up to 6 inside pages ) You can delete items to reduce the number of pages, conversely if you add songs, hymns or other items then pages will be added by the system. 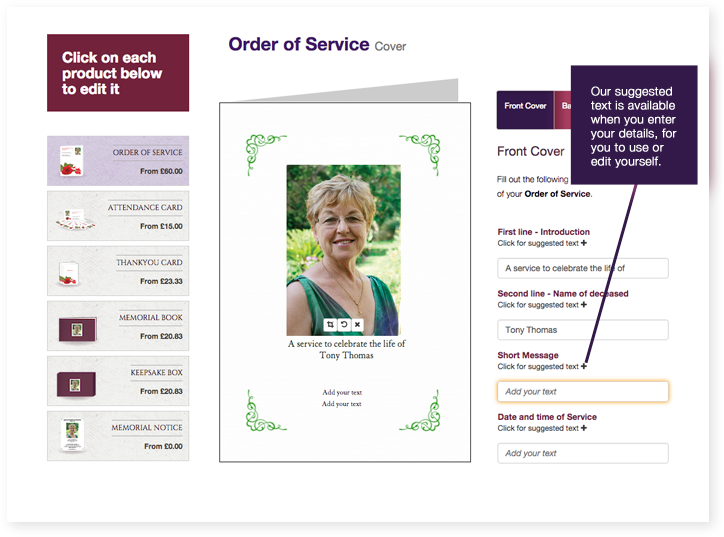 If you require a larger Order of Service please contact our Design Team on 01600 775350 or by email info@lovingtribute.co.uk and they will be happy to help. Can I change font sizes, colours, and alignment? The site allows you to change templates (which control the overall look and design of your service) and to use italics within some of the text, but you are not able to change individual aspects like font size or colour. In the past we have found that this has led to some people finding their orders ended up looking a bit messy and so our templates have been specially created to produce an elegant outcome at all times. I’ve never done this before, what information should I include? We have included some suggested text to help you complete your front and back pages and our suggested header titles for the inside pages are also there to guide you (see images below) Our comprehensive library of Hymns and Poems is also designed to help make the process as simple as possible. Editing - How do I change the order of the content in my service? Using the up and down arrows and trash can icons (see image below) you can move content around within your order of service or delete completely. 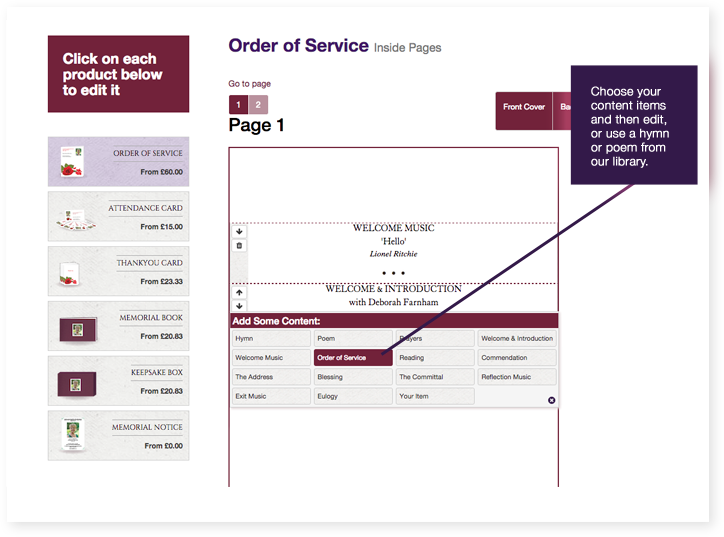 It is important to note that the system automatically adjusts the position of items depending on their length to ensure your order looks great and prints well. Pages may be automatically added or deleted because of this. How do I download my proofs to my computer? 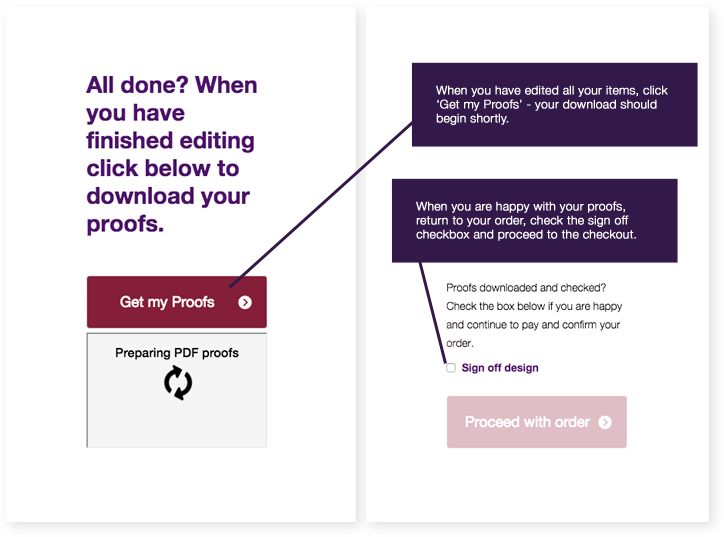 Once you have created your first draft, you will be able to download a file containing your proofs using the ‘get my proofs' button (see image below). This file can then be opened and printed out or sent by email to family members for checking. You will also receive an email containing a link to the download making the process of sharing via email very simple and straightforward (see image below). This email also contains a link back to your account to enable you to continue editing your order and to complete your purchase. Don't panic! - You can change your password by clicking the 'forgot password' Link. You'll need to fill out the email address you use for logging in and we'll email you a link to enter a new password. What if I need something different to the designs provided? Please contact one of our team on 01600 775350 or by email info@lovingtribute.co.uk and we will be happy to discuss your requirements. Our Bespoke Design Team can produce whatever you may require. There is an additional fee for this service of £50 on top of the usual product price, and includes up to 3 amendments. What do I do if I am having trouble using the website? 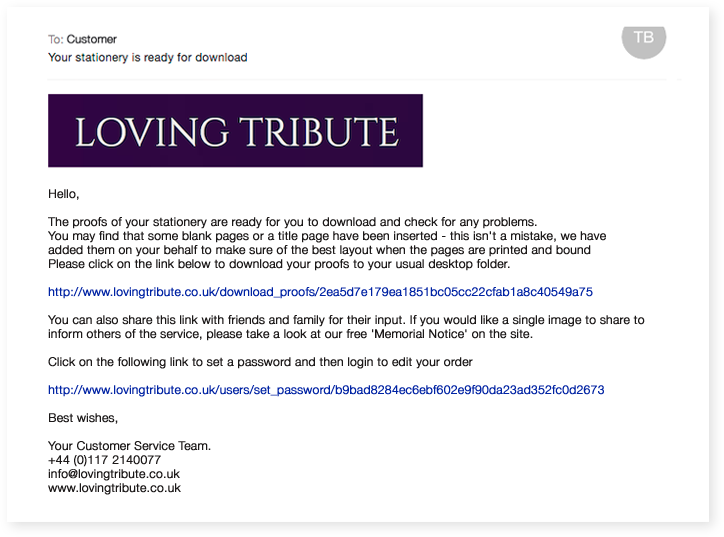 If you are having any issues using the system then please don't hesitate to contact one of our team on 0117 2140077 or by email info@lovingtribute.co.uk. We are very happy to help you through the process. Payment for your stationery will be requested via the online process using either a Credit or Debit card or via your Paypal account. There are no additional fees for paying by credit or debit card. On receipt of payment, your order will be processed. Our prices are clearly displayed in our Price List section and at the checkout stage. Our prices are fully inclusive of vat where applicable and delivery is free for all orders over £60. An additional delivery charge of £10 is applicable to orders with a value below £60 after discounts have been applied. Delivery is free for all orders over £60 after discounts have been applied. For orders below £60 there is a standard fee of £10. Urgent express deliveries can be arranged for an additional cost, please contact us by calling one of our team on 01600 775350 or by email info@lovingtribute.co.uk to discuss. How much time do you need to deliver my order? We have a cut off time of 12 noon for orders to be despatched within 2 working days (not including weekends), e.g. for Wednesday delivery we require the order to be completed online by 12 noon Monday. For a Monday delivery your order will need to be completed by 12 noon Thursday. If you have an urgent order we can organise express and Saturday deliveries for an additional fee. Please contact us on 01600 775350 or by email info@lovingtribute.co.uk to discuss your requirements. What If I’m not home to receive delivery? You are able to choose your preferred address for delivery on the checkout page. Many customers choose to have their order delivered to the Funeral Director arranging the service. Our tracked courier service also enables you to know the hour time slot allocated to you on the day of delivery. How is my stationery delivered to me? We deliver using an overnight, next working day, courier delivery. If you require a particular delivery date please contact one of our team on 01600 775350 or by email info@lovingtribute.co.uk to discuss these arrangements. We track all of our deliveries so we can inform you on the day of the hourly time slot that your order will be with you. Yes, we do deliver to Northern Ireland however please contact one of our team on 01600 775350 or by email info@lovingtribute.co.uk to check on delivery times and prices.